The condo is located at the Zama Village building (marked with an “A”), inside Aldea Zama, the most exclusive development in Tulum and the only one on the beach side of the Tulum-Cancun highway. 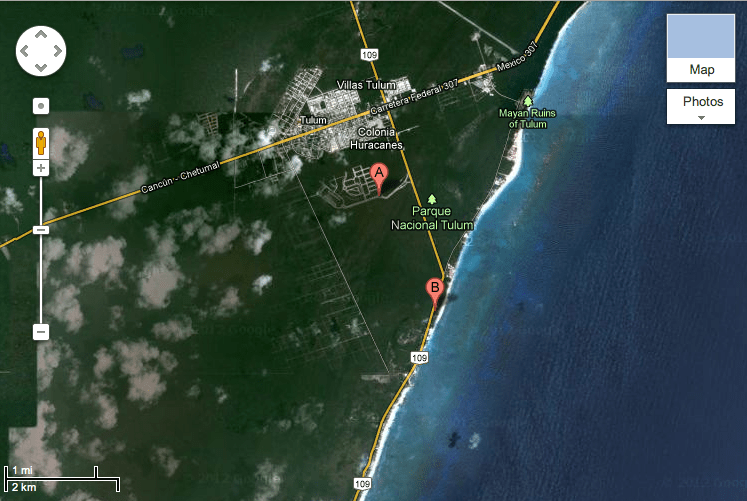 The closest beach (Papaya Playa) is marked with a “B”, approximately 3 km away from the condo. Aldea Zama is located between the Tulum town and the beach. The Aldea Zama entrance is 2.000 meters (1.2 miles) away from the beach road. You can either drive, walk or ride a bicycle (provided for free) using the brand new bicycle path connecting Aldea Zama with the beach. How to get to Aldea Zama – Zama Village? 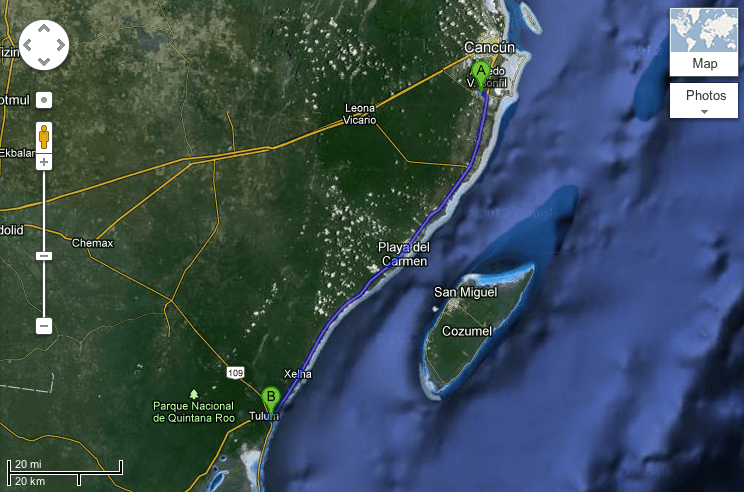 If you fly to Cancún (the nearest airport) it will take some 1,5 hours driving carefully, Tulum is 118 km (73 miles) away from Cancún. Take the airport exit road and when you get to the highway turn right (direction to Playa del Carmen). Drive by all the entrances of the Mayan Riviera resorts and the towns of Puerto Morelos, Playa del Carmen, Puerto Aventuras, Akumal, Chemuyil (never leave the main highway). At the crossings of Puerto Aventuras and Playa del Carmen keep on driving on the main lanes (elevated to avoid urban traffic). Once you get to Tulum keep on straight, pass by the crossroad of the Mayan Ruins and when you get to the second crossroad (traffic lights -you will see a San Francisco de Assis supermarket on your right hand side) turn left to find the entrance of Aldea Zama 1 km ahead on the right hand side of the road.